Studio Carry On Harry Talk Show, March 2017 , Guest Lynne Cockrum-Murphy, Ed.D., L.I.S.A.C., is an intuitive consultant and spiritual teacher who uses higher guidance to assist those seeking change. She works with the seventh plane to remove limiting beliefs from this and previous lives and to offer downloads for an expanded sense of self and possibility, thereby changing work and life conditions to a happier state for her clients. In addition to facilitating physical healing, emotional growth and removing blocks to joy, purpose and meaning, Lynne uses #ThetaHealing® and Access Consciousness® tools, channeling and counseling to support her clients whatever their personal goals. Her compassion and gentleness create a safe space for those seeking healing. Lynne is a Certified #ThetaHealer® and Instructor (of Basic, Advanced, Manifesting and Abundance ThetaHealing classes) and Access Bars® Instructor, and an Access Consciousness face lift and trauma release facilitator. She is also a licensed Substance Abuse Counselor and counseled in a drug treatment center for five years. Lynne teaches meditation and has led group meditations and taught throughout the northwest, southwest, and Caribbean. Lynne received her doctorate in educational administration from Arizona State University and has masters and bachelor’s degrees in special education. She is also an adjunct professor for Northern Arizona University College of Education. She is retired from teaching special education and administration in the public schools after thirty years. She now writes and consults. She resides in Arizona with her husband and cats. 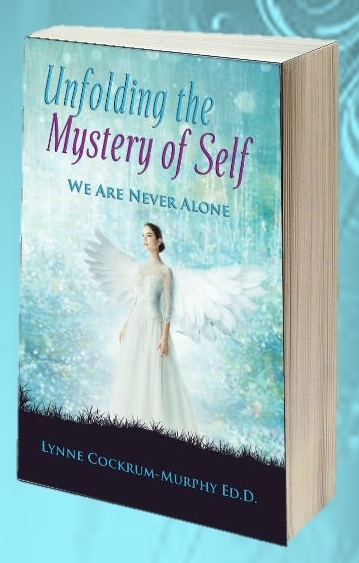 Unfolding the Mystery of Self – We Are Never Alone...Think of this as a perfect read for someone on a spiritual path who doesn’t follow traditional philosophy or religion. By sharing personal stories and examples Lynne shows how she did it and provides a map. She shares honestly about her life’s experience and the miraculous events that shaped her developing awareness and movement into self-realization. She shares the wisdom of other spiritual teachers from Yogananda, to Gary Douglas, to Swami Rama to Deepak Chopra and covers questions such as: ï‚· Do you need a guru? ï‚· Can angels take human form? ï‚· Does religion fit into spirituality? No other book includes the American female experience blended with Buddhist, Hindu, Christian, and new age teachings to make the eclectic desirable and deeply satisfying. She shows us truth, trial and error and results. Her evolution from angelic childhood visitations to daily rapport with guides, archangels and others demonstrates how possible it is to move from life as struggle, or mundane to the richness that comes from trusting there is so much more. We are never alone. We can always call out for love, support and information. We can give credence to what we have seen yet dismissed knowing now that there is reality beyond the physical beyond the known. She also explains her experience as a healer, what it takes, and what is evolving. Full of hope, potential and encouragement that we are on a trajectory to self-realization, that greatness is the foundation of every being, that as more is revealed love expands and we transform. Our beautiful light shines through. Holiness is apparent even in the average woman. Her first book Living Hope – Steps to Leaving Suffering Behind (2015), begins with the true story of loss after a house fire killed her sisters and father leaving her badly burned. She explains how to move forward from loss and chaos to a life of meaning and purpose. The story is a model of hope, action and success. Faced with PTSD, depression and an eating disorder, she shows how growing up in trauma and chaos doesn’t have to ruin one’s life, but can also motivate one to a life of meaning and purpose. Over eight million Americans are diagnosed with PTSD and many read this story of hope, making it an Amazon #1 Best Seller. Unfolding the Mystery of Self, traces the next step as she travels the path of personal growth from victim to empowered masterful healer and spiritual being. Her unique path and process described in her books shows the reader ï‚· anyone can overcome obstacles ï‚· how to marshal resources ï‚· the potential for enlightenment is in the most ordinary of people. Lynne has a doctorate in educational leadership, teaches for Northern Arizona University, is a retired special education teacher, a licensed substance abuse counselor, an advanced level certified ThetaHealer® and instructor, and a certified Access Bars practitioner and instructor. In addition to healing herself, she has studied and is now sought after for spiritual guidance, for healing and her gentle, wise support .